Centurion promises quality products, excellent customer service and personalised sales support, asking to be your go-to supplier throughout December and into 2019. 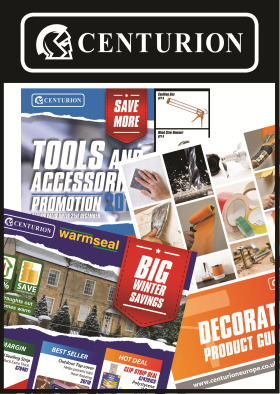 Centurion currently has some great promotions running across a number of ranges including hardware, ironmongery, draught exclusion, decorating and tools. Within tools, Centurion is highlighting the best of the best, with quality Centurion-branded products to give retailers everything needed to offer customers a comprehensive range of high quality tools and accessories. The new Decorating Product Guide is available from Centurion now, with paint brushes, rollers and trays, fillers, solvents and adhesives, paints and varnishes, sanding and preparation, tapes and adhesives, and much more. Centurion adds that, this time of year also offers retailers the chance to drive additional sales with the Warmseal draught exclusion range. Contact Centurion today or email marketing@centurioneurope.co.uk to make sure you get access to the latest promotions, demand is always high so get your orders in early. TAKE NOTE: Centurion will be operating extended opening over the Christmas period. The company will also be giving away some great gifts as part of its annual Christmas Giveaway. More information on this can be found on its website.